Life presents memory triggers usually, mostly, without any expectation. Tonight is our first winter storm in northern Arizona, with sub freezing temperatures expected, maybe even snow. 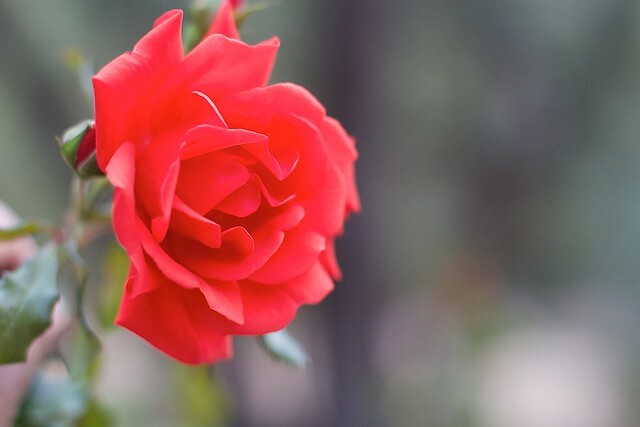 On my morning rounds in the yard, I was stunned to see new roses and buds on the bush. I know they won’t make the night, so I thought “why not cut them?” Then I thought, “I never put flowers out in my house.” I then went recursive, where the exit condition was a pair of scissors. In the house I am looking around; I have no vases. Looking around my utility closet I spot at the back of my top shelf I shiny cylinder. Yes, it’s a thermos I have never used. And it has an Internet 2 logo on it. It was 2011, and I had visited George Brett in Falls Church. One of the saddest things of 2015 was getting the news that George passed away after a long illness I am sure he fought valiantly. George was Chief Information Architect at Internet 2 for almost 10 years — did he give me a thermos in 2011? I remember I had a cough, and George was generous with medicine. I think the thermos goes back to 2008, something George sent as an appreciation for being a remote panelist on virtual worlds at an Internet 2 Spring meeting. George was so keen for wild ideas, he let me preset as a dog in Second Life. Those were the days. Thats what passed for innovation. 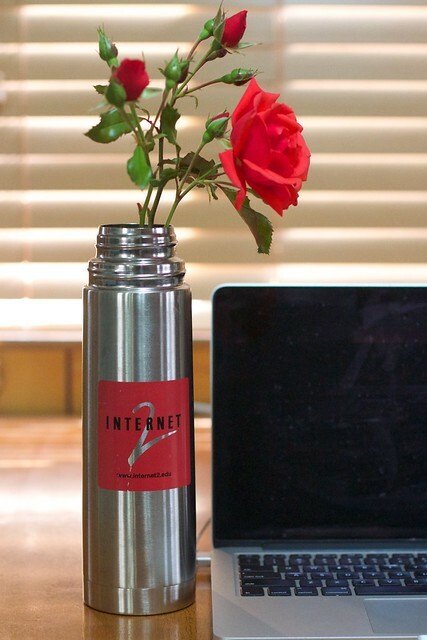 And for some reason, I have had that un-used Internet 2 thermos sitting around for 7 years. Until I found a need for it today. Because of an accidental rose. I should fill it with a smooth warm beverage, go for a walk in the woods, and remember George’s wit and kind nature. Maybe travel with a small talisman. Many things intertwined and connected, by the barest of circumstances. 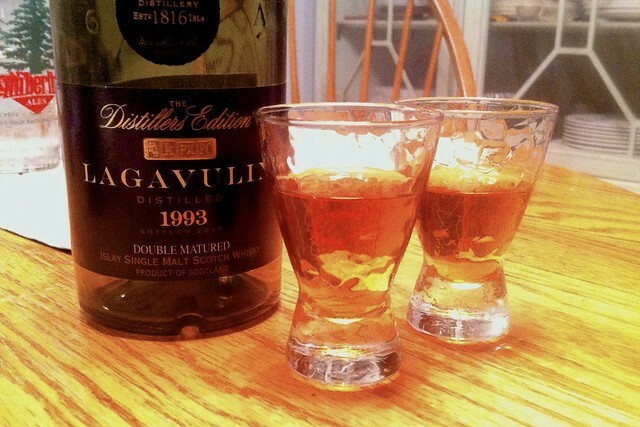 Thanks for sharing, and here’s to George. This resonates with me on so many levels. How our minds do stumble through the memories when we unexpectedly come across a trigger. Have a drink for me, my friend. I’ve been cutting roses today to bring into my house, and similarly came across a small jug that was my mum’s. This connects to me a practice of hospitality of hers that really anchored my childhood. When she was expecting an overnight visitor she would pick a really tiny bunch of flowers from her garden and leave it on the dresser in her guest room, often in something small — a sherry glass, a cream jug. Whenever she visited someone in hospital, she took a similarly small bunch of fresh flowers because, as she said, hospitals are completely overwhelmed with formal floristry and then no one has any space to put a cup of tea. From her I learned that when you’re taking a small bunch of flowers somewhere, wrap the stems in wet kitchen paper, and contain it all in a small plastic bag or a clutch of aluminium foil so it doesn’t drip. Her secret horde of saved elastic bands came into its own for this moment. Thank you so much for writing this. Lovely roses, too.